Every once in a while a WordPress plugin comes along that is so mind-bloggingly useful and beneficial that it actually changes your own habits. CoSchedule is such a plugin. Look, we all have trouble getting new content up into our sites. We all understand the impact that great blog content has on our SEO, our traffic, and well — our bottom line. Yet we’re all so very busy. I know. I’ve been there, and I especially know better, as I produce content and marketing campaigns for a living. And still my own blogs are withering on the vine just waiting for some attention, a moment of care and some new fuel to breathe another day’s life back into them. Alright, I’m being overly dramatic, but hey it’s my blog and I’ll whine if I want to. Well, that day has come. Please say HELLO to CoSchedule. Of course in web parlance, the old days equates to “last year” but that’s not the point. Back in the old days, we used to have to leverage a Google Calendar to manage a brand’s editorial calendar. This was a big pain if the brand was using Outlook instead of Google Apps. Also, Google’s UX/UI leaves an awful lot to be desired, the Gmail and Google Calendar environment is difficult for the layperson, as they bury settings in very non-intuitive places, and finally, Google Calendar doesn’t interface with the WordPress blog itself, which means that your team is double-handling calendar events, titles, descriptions, etc, etc. What I love about CoSchedule (and yes, I actually use it here on this site) is that I can manage my blog calendar from a screen directly in each blog post, OR I can access an aggregate dashboard (like a bird’s eye view) of all of my connected blogs by logging into my account on CoSchedule’s site. All my stuff, all in one place?? Oh hell yes, please. My team and I have 20+ blogs under management, and it’s much easier for us to compose our content in a shared environment, where we can collaborate with the client, share revisions and iterate before loading the post up into its final destination. We utilize Evernote for this purpose, and CoSchedule makes it insanely easy to convert any Evernote post into a WordPress blog post. 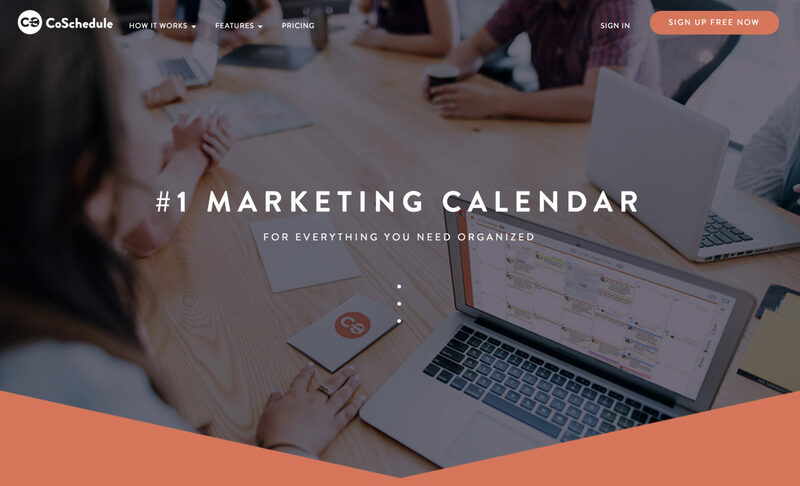 CoSchedule also connects to Google Drive, which is helpful for the folks we are still using Google Apps to compose and collaborate on their content. If you’re still using Google Calendar to track your content, no worries. CoSchedule will talk to it. 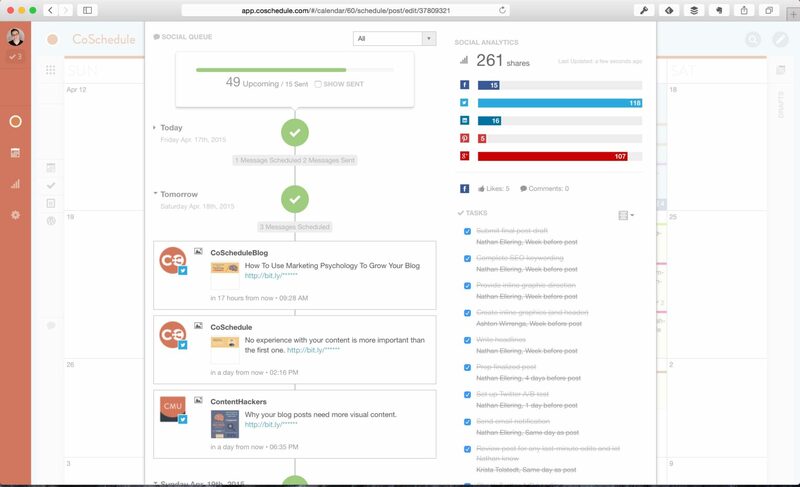 The pro marketers will be happy to learn that CoSchedule automatically adds UTM tracking tags to all links shared via social media, which are easily viewed in Google Analytics via custom analytics dashboards. To Schedule or not to Schedule. Socially, I mean. One thing I’m still getting my head around is CoSchedule’s social share scheduler dealy. It’s terrific, don’t get me wrong, but I’m already using Sprout Social for my social management, and many of my customers are using Hootsuite or other tools. 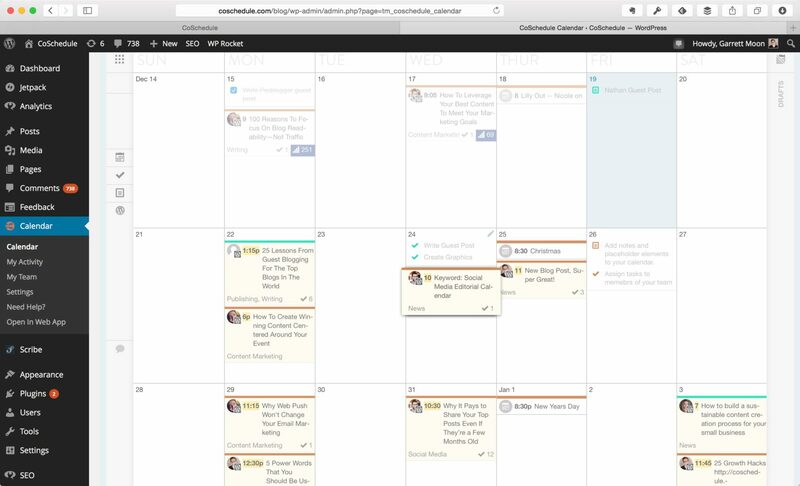 I can see a lot of benefits to managing social in this way, and CoSchedule’s social calendar allows me to manage my social scheduling in a very cool and efficient way, but I don’t use it in this way for one reason only. I have some clients on CoSchedule but not all of them, and for this reason it makes more sense for me to handle all of my clients’ social media campaigns in a larger tool geared more for that. It’s about having the right tool for the right job, and I have no doubt whatsoever that CoSchedule’s social scheduler will be a perfect fit for most teams and individuals. Have you been struggling with getting your head around your editorial calendar? If so, you might want to give CoSchedule a look. Barring that, head over to the Contact page and drop a line. We’d love to talk to you about getting your social media strategy under control and heading in a profitable direction.